The only thing remarkable about the last day of our trip was the fact that it seriously took an entire day. We went to the airport on an early shuttle and ended up with just enough time to go through security, get to the terminal, and be bussed to the airplane. I was sick and my nose was leaking profusely. I tried to keep it to myself (and let people see me pour on the hand sanitizer) but I'm sure I was the object of many a head shake. When we arrived in Newark, we had to go through customs. That means we had to get our luggage, have our passports stamped, recheck the bags, go through security, and find our terminal. We had more than 2 hours to accomplish that - so we figured we'd get something to eat as well. Unfortunately one of our luggage handlers had a medical emergency on the tarmac. Honestly I can't tell you if it was a he or a she, or is s|he fell or a had a heart attack. I can tell you removing that person delayed the luggage by 90 minutes. We had our big suitcase. We were just missing one duffel with all the souvenirs. Yes, it came and yes, that was the longest wait. But it was not the only wait. Customs was smooth, but did not move quickly. And the line to recheck luggage was down two hallways. We were still 45 minutes from our flight, and therefore did not qualify for the 30 minute or less fast-track. When we finally got the next set of luggage screeners, the sight was disconcerting to say the least. We were told to leave our bags just anywhere on the side. We had no time to argue. Jesse maintained his cool - until he realized we had to go through security again. Then came the "I hate Newark" rant that comes from anyone who has ever had the EWR experience. But as you can guess, it all worked out. We found our terminal, grabbed something to eat, and boarding began just as we were were finishing our food. And thus concluded Cruise 2007. Our flight back the states left from Milan. Neither of us had any desire to see Milan, so we decided to take a train that Sunday afternoon. We sat in the technologically advanced first class cabin, with adjustable seats and electrical outlets. I started looking through the pictures we had taken. Jesse started listening to his i pod and dozing. Rome started melting away. In place of monuments and tourists, there were mountains and trees. I'm glad we saw that part of the country. It as if Rome was leaving us, instead of the other way around. Milan is not Rome. The people are not as friendly. The train stations are not as clean. The map we bought seemed to be useless. Milan is not Rome. Here's the rundown: We got out of the technologically advanced first class cabin in Milan. I then had to pay to use a very dirty bathroom, where no one stood in line people were dashing into open stalls. We then paid for a map that didn't show the neighborhood surrounding our hotel. We took city trains to an express terminal, where we took another train to the airport. At the airport, we found a free shuttle to our hotel. I think we spent 8 hours getting from One hotel to the other. We were exhausted. Our hotel was fantastic. There was a flat rate for Internet and after some finagling, we had power to the computer. Actually we had had power the entire time via an adapter. But it didn't have a slot for the third prong and we didn't think it would worked. We were wrong. We had dinner in the hotel restaurant and from what I remember, it was delicious. While it wasn't the most eventful way to spend our last day in Italy, we were exhausted. And we went to bed. In one day (which was really 2), we saw the sites, at the food, and bought the goods. On our last night in Rome, Jesse and I bought a bottle of wine (and an opener) and sat on the Spanish Steps. As I'm sure I've mentioned, the best part about sitting on the Spanish Steps is watching the people. Some don't know they're being watched, but I'm sure others go there just for the attention. 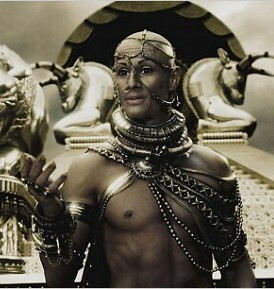 I call this man Xerxes. There are more similarities than not. He strutted up and down the steps, granted every photo request, and (as you can see) was fully able to strike a pose. I took a few pictures of him. He entertained us for about an hour. Otherwise, we sat and drank our wine out of the bottle. I didn't think we were on anyone's radar until two kids offered us cups. After we emptied the bottle, I knocked it over. So their timing was perfect. After we drank, we ate. We picked Trattoria Otello all Concordia based on a recommendation from Frommer's. It was an excellent choice and we had a lovely time. We wrapped up Rome with a walk back to the Colosseum, and a tax ride back to our hotel. We walked out of St. Peter's Square, bought some trinkets, and followed another crowd heading towards the Sistine Chapel. On the way, we decided to eat at a place on the corner. There was nothing extraordinary about it but I'm pretty sure it was the best pizza I ate in all of Italy. Of course that could have been because I was really hungry. Our menu consisted of Coke, Fanta, bruschetta, pizza, and lasagna. It seems like a lot when it's written out. The service was quick, the food was delicious, the bill was not steep and there was soap in the restroom. I highly recommend it. We were less than two blocks from the Sistine Chapel but we never made it inside. My only explanation is this sign. It clearly states the chapel closes at 1pm during the week we were there. Had we known that, we would have planned accordingly. Still, I think this was our only missed opportunity and I'm proud that there's only one. We planned ahead and didn't leave a lot of room for error. This one just happened. As a result we had a lot more free time in Rome and not a whole lot else to do. Fortunately we found the perfect way to pass the time. We started shopping for souvenirs. We both had a list of ideal items we would have liked to have found. But the reality is that there are few souvenirs sold by hundreds of vendors. Unique gifts might be out there, but they're nowhere a tourist would be able to find. Aside from shopping, we went back to the Spanish Steps and the Trevi Fountain. I liked the fountain better in the daytime - because I could see just how many people were there. It was not a comforting sight, but at least I was aware. We once again sat near the fountain - with some gelato. I found a place I had been to back in 2000. It was still there and the gelato was still fantastic. Even Jesse, who has a odd distaste for good foods, thought the gelato was phenomenal. That is a very high complement. So we sat, we stood, we shopped, and we had seen all we could within reason. We had plenty of time to enjoy our last night in Rome. Once we made it into St. Peter's Square, we stopped. It's breathtaking - and not in the dramatic way a guy in a romantic-comedy says a gal is "breathtaking." I mean to enter St. Peter's Square leaves you spinning on the spot to take it all in, with your mouth agape and mind churning. Say what you will about the Catholic as an institution. The Vatican is beautiful. Take a look for yourself. The church even made the line look small in the beginning. But watch that video again and see how far it stretched. It did seem to move quickly and I occupied myself by taking pictures. Our first run in with security was the usual x-ray / metal detector arrangement every airline passenger should know and love by now. The we came across the fashion police. Now more than a tourist attraction, or scene from Angels & Demons, the Vatican is a church. You say it's the most churchy-church out there. So if you go, make sure you'd wear something you could wear to church. I don't mean you ought to dress up, but if you are showing shoulders or knees (male or female) you will have to cover the offending parts before you go inside. We had not thought about appropriate dress even once. Fortunately, we were covered, literally. All this to say: we went to the Vatican and it was lovely. Inside we saw art I cannot describe and opulence that surpasses wealth. We saw tributes to popes past and Jesse dabbled in a confessional for about 3 seconds before he started smoking. Even though it was our first stop of the day, it was mentally exhausting. There were so many impressive parts, I felt overwhelmed by it all. Jesse said he felt the same way. I don't how long we were there, but we left to go find the Papal Tombs. Another day, another chance to explore. I woke up refreshed and ready - and not in the least bit tired of traveling. We had been on vacation for nine days, and we both wanted more. Our itinerary was short: Vatican & Sistine Chapel. We wanted to take it easy because it was our last day before we began heading back to the states. The day turned out to be even easier than we anticipated. Technically, our first stop was breakfast, where I ran into an old favorite: peach jelly. My first rendezvous with peach jelly happened when I studied abroad in Spain. Peach Jelly is the absolute best jelly for toast. I don't think I've ever seen it in the states. Americans, it seems, do not associate peaches with top-of-the-morning taste-bud pleasure. Anyway peach had a new friend: cherry. Before we left the hotel I would put some in my purse to bring back to Las Vegas. The lady at the front desk recommended we take the bus to the Vatican. Jesse insisted we take the train. I didn't think it mattered either way, so we took the train, got out, and followed the crowd. But before we got off the train (before we got on really) we saw this ad for the Gay Village. I'm not sure what it is, buy we got a kick out of the gay bears. I suspect its a television show, but I can't be sure. As far as I'm concerned, it's just cute... and gay. It was pretty easy to find the Vatican from the train station. We were among hundreds of people sidestepping beggars and peddlers en route to a place just beyond our sight. The Vatican is surrounded by a giant wall. Instead of being solid, it's a group of giant pillars. They were the first indication of how small we would feel at the Vatican.